The LoRa Alliance, the global association of companies backing the LoRaWAN standard for low-power wide-area Internet of Things (IoT) networks (LPWANs), has surpassed 500 ecosystem members in just over two years. 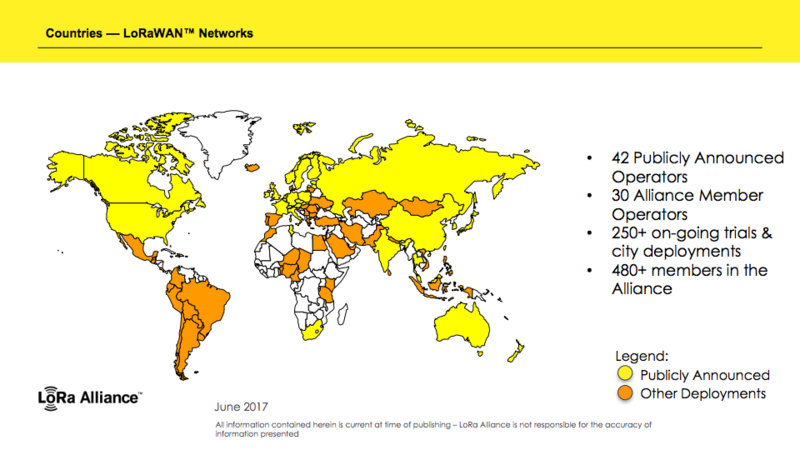 Those members, along with their partners and customers, are deploying the LoRaWAN protocol, with 42 publicly announced operators—a 3.5x increase in one year—and over 250 ongoing trials and city deployments. India: added support for the country’s 865 MHz band, which enabled the recent deployment announced by Tata Communications that includes managing data from 200,000 sensors and gateways using Hewlett Packard Enterprise’s Universal IoT platform. Australia: the LoRa Alliance demonstrated its responsiveness to the constantly changing technical landscape by rapidly adding support for Australia’s recent regulatory change to its ISM band. These changes greatly extend the maximum range and payloads of LoRaWAN networks, using even the lowest data rates. Korea: expanded Korean band capabilities. Global: added more consistent support for regions where the maximum allowed transmit power is expressed as equivalent isotropic radiated power (EIRP). This EIRP support makes it much easier for network operators to manage heterogeneous devices while ensuring regulatory compliance. For more information, visit www.lora-alliance.org.